1Password is a popular password service which offers apps and browser plug-ins for a number of platforms, including Mac, Windows, iOS and Android. The service automatically generates strong, unique passwords whenever a login is needed, keeping them in a keychain under a master password. 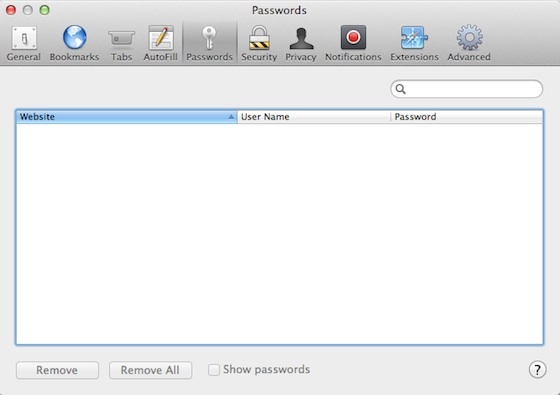 Once authorized, 1Password can then automatically fill in user names and passwords when needed without the user having to know the often complex passwords created for maximum security. But with Apple continuing to push out developer betas of OS X Mountain Lion and Safari 5.2, it is now becoming apparent that the company is looking to bake similar functionality directly into Safari. One of the more visible changes in the Safari 5.2 developer builds has been a new "Passwords" pane in the application's preferences, offering a way for users to access stored user names and passwords for various sites and services. As currently deployed, the pane is essentially a more convenient way to view passwords already stored and accessible through the dedicated Keychain Access application. Safari can automatically suggest and remember unique, secure passwords for websites you choose. With Mountain Lion's focus on taking greater advantage of iCloud services to keep data synced across devices, it seems reasonable to speculate that Apple has plans to roll this password functionality out to iCloud and iOS as well. The move would allow "unique, secure passwords" created on one device to be automatically available for use on another device without having to manually record or insecurely copy and paste password information for transfer. Apple has already revealed its plans to use iCloud to integrate browser activity across devices, as evidenced by Safari tab syncing making its way into test builds. And interestingly, Apple previously offered keychain syncing across devices with .Mac and MobileMe, but discontinued the feature with the transition to iCloud. It now appears that the functionality was removed while Apple worked to revamp and expand it to increase its functionality. Apple has also signaled its intention to broaden the browser syncing features of Safari with the iCloud preference pane in System Preferences under Mountain Lion. While the Safari section has been titled "Bookmarks" under Lion, with the addition of browser tab syncing and perhaps new user name and password syncing the section has now simply been retitled "Safari". But while Apple certainly seems to have all of the pieces in place for higher security unique password generation and syncing across platforms via iCloud, the feature has not yet been introduced for testing in developer builds of OS X Mountain Lion. The feature has also not been seen in iOS builds, although the company has yet to begin developer testing on either iOS 6 or an interim iOS 5.2 update. I think I'm the only person in the world who tried and didn't like 1Password, so I'll be interested to see if Apple somehow does it differently. I really am not liking the way Apple has "upgraded" the password thing for my apple account. It used to be just a password. Now if someone answers five questions about me that can probably easily be phished through casual conversation (what school did you go to?) they defeat my password. My only alternative is to use false answers for those questions. Which means I need to keep track of my answers, which means I need something like 1password and if the password for that gets cracked, the keys to the kingdom are truly compromised. You could use your existing password as answer to all questions. That way you are back to one password only. As the Keychain App already has the ability to suggest and create secure passwords I guess this is a logical move. However, until they can be synced between devices, 1Password have nothing to fear. I love 1password. I'll probably stick with them since they sync to my work Windows machine as well. And interestingly, Apple previously offered keychain syncing across devices with .Mac and MobileMe, but discontinued the feature with the transition to iCloud. It now appears that the functionality was removed while Apple worked to revamp and expand it to increase its functionality. If this is true, I'd be ecstatic. I was disappointed when keychain syncing was removed, but if this was done to improve it, I'm game. Now if Apple works on Documents as a possible replacement for iDisk (using Dropbox now which is great), I'd be a happy camper with iCloud. This is great. I also use 1password and although I do like OSX's version, I do not like how iOS implements it. Looking forward to see how Apple handles it! The password pane reminds me of the similar thing in Firefox. I'm already a heavy 1Password user. I wouldn't be interested in Apple's password syncing unless it would also work with alternative browsers and across platforms. Safari for Windows? Somehow I doubt it. So what's stopping a malicious program simply cracking the master password and greeting all the high security passwords? Thats where they are now if youre using DropBox. The encryption is good though. Any app that you grant Dropbox permission to has access to your 1password database. A malicious app developer could, for example, put an app on the App Store that masquerades as a text editor that syncs with Dropbox. At a given time interval months from now (so as to evade App Store rejection), it uploads your 1password database to their server. At that point the developer can brute force the 1password database (could take days to years depending on your password strength) and have access I all your passwords. Even if 80% of 1password users use a strong enough password to make brute forcing a non-worthwhile endeavor, it's the unfortunate 20% who would get their password exposed by this sort of attack, and thus make this attack a profitable venture for a black hat. It's a very feasible scenario. On the other hand, with Apple's hypothetical solution, it sounds like your master password would be sandboxed away from app developers whose apps access iCloud. My understanding of the iCloud APIs is that an app can only access data inside its own sandbox. Personally, if Apple comes up with a password syncing solution, I'll certainly switch. One option which must be built in, is the ability to select maximum and minimum character passwords. The current password generator in Keychain allows passwords with a minimum length of 8 characters and a maximum of 31, so I suspect this would be the same.